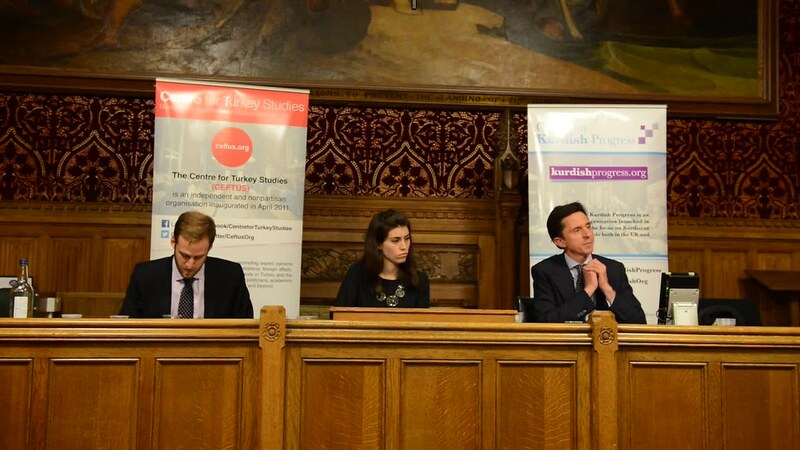 In partnership with the Centre for Turkey Studies, this event was kindly hosted by Diane Abbott MP and the debate was chaired by Telegraph Journalist, Raziye Akkoc. The keynote speakers were Dr Neil Quilliam, Acting Head, of Chatham House's Middle East and North Africa Programme and Mr Jonathan Friedman, Turkey and Middle East Expert at Stroz Friedberg and Associate at the Centre for Turkey Studies. Mr Friedman opened his speech stating that Turkey is fighting three wars in the south. A hot war against the Kurdistan Workers' Party (PKK) and its affiliates, a proxy war against the Assad regime in Syria and what could be called a "phony" war against Islamic State (ISIS), alongside other wars at home between the government and groups such as the Fetullah Gulen movement. He stated that the pro-Kurdish Peoples' Democratic Party (HDP) has been seen by the Development and Justice Party (AKP) as a powerful threat to its aims to maintain a one party government, and for this reason, the Turkish government has resumed its hot war with the PKK to discredit the HDP in the public eye. He continued, stating his belief that this policy would also be conducted had a more Kemalist rather than an AKP Turkish government been in place. He added that Iran and Russia have out manoeuvred Turkey in the proxy war occurring during the Syrian conflict, having committed far more resources and military personnel, including ground troops in Iran's case. He stated that Turkey's war against IS compared to the phony war between Britain, France and Germany during the first year of the Second World War in 1939, in which military action was not taken for around a year, despite Germany having been recognised as an enemy. He argued that despite Turkey's viewing IS as an enemy, it is unlikely that Turkey would undertake any effective action against this movement, because of its role in keeping Kurdish militant forces pre-occupied, fighting IS rather than against the Turkish state. He argued that this policy has disadvantaged Turkey in that it opens the country to more attacks akin to those which occurred recently in Ankara and Suruc, making the country unstable, that it has pushed the US to support the PYD and other Kurdish movements and that it has made President Erdogan personally unpopular, given his being blamed for allowing these attacks to occur, especially in the Turkish capital. Dr Quilliam spoke at length about the war in Syria against the Assad regime. He stated that Russia's intervention in Syria has been a game changer, having strengthened the Assad regime and making it increasingly likely that he will be a part of the ultimate solution to the crisis. He stated that a "no-fly" zone with a UN resolution would not be possible because Russia would vote against it as part of the UN Security Council. Dr Quilliam continued, stating that US and Russian interests in Syria have meant that the US-backed Kurds are strong, that the Russian and Iranian-backed Assad regime is also looking stronger, but also that IS remains strong, and within this framework, Turkey's ambitions to shape Syria both now and in the future are increasingly strained as a result. The event was followed by a question and answer session. Dr Neil Quilliam is the acting head of the Middle East and North Africa (MENA) Programme at Chatham House. He first joined Chatham House as a senior research fellow in January 2014, then as senior consulting fellow from September 2014. He previously served as senior MENA energy adviser at the Foreign and Commonwealth Office (FCO), senior MENA analyst at Control Risks, London, and senior programme officer at the United Nations University, Amman. Neil has lived in Saudi Arabia, Jordan and UAE, and has travelled extensively around the MENA region, working on a variety of development, education and research projects. He has published a number of books and articles on international relations and political economy of Syria, Jordan, Iraq and the Gulf Cooperation Council states. Mr Jonathan Friedman is an assistant director at global risk consultancy Stroz Friedberg, where he advises investors in Turkey and the Middle East on political, security and reputational risks. He is also an associate at the Centre for Turkey Studies, and a co-author of recent analysis on Western policy in Syria published by Chatham House. Before entering risk consulting, Mr Friedman worked in various roles on Capitol Hill, including for US Vice President Joe Biden.